Greetings one and all. Phew, what a year, and what a run up to Christmas. The festive bug has definitely bitten North Dorset and we have been busier than bees in summer at the farm this week. It has been a delight having so many familiar faces in the shop, and people’s enthusiasm and excitement has been infectious! Its great hearing how people plan to use their veg, and we’ve gleaned a few ideas ourselves. Out in the fields it’s been Brassicas galore, and in all their glory. January Kings, Savoys, purple sprouting and of course… sprouts. We will probably dream of picking sprouts for the next fortnight! Now it’s Christmas Eve, all the orders are safely collected, the shop doors have closed for the last time this year and the fire is going in the farm house… but, there was one last thing before Christmas. As many of you will have heard, Child Okeford village church is temporarily out of action, but thanks to the hard work of Lydia et al. alternative venues have been found for all the seasons’ services. Tonight it was our turn to host the annual crib service. And what a treat it was. 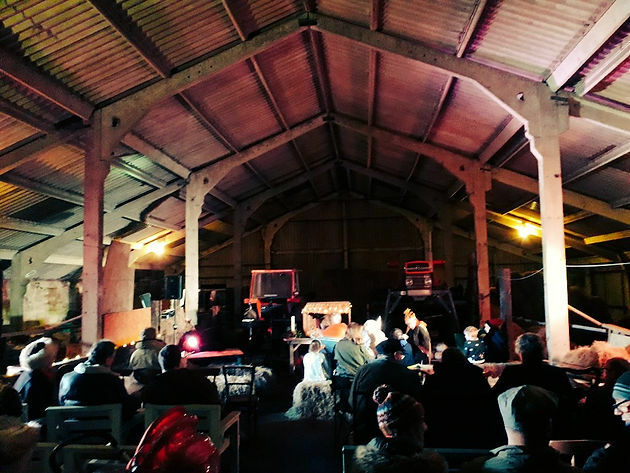 It is not often you get the chance to see the nativity played out in a real working barn! It was such a privilege to have so many people come and celebrate Christmas. It really was inspiring to see that even in this day and age of central heating and creature comforts, that everyone is still game to pull on a hat, set themselves down on a straw bale and sing their socks off to the tune of “Ding dong merrily on high”. It nearly blew the roof off! Well done everyone, what a great celebration of the meaning of Christmas. So as we all prepare ourselves for the marathon that is Christmas day (literally for some, there is a park run on in Blandford tomorrow, we may see you there!) take a moment to reflect on the year and appreciate those around you. We will be open in the New Year from Saturday the 5th January. Whether you’re an old hand at the farm, or starting a new year’s resolution, we look forward to welcoming you to the farm and sharing in our goal to bring sustainable, delicious and beautiful vegetables to the community. Merry Christmas and a happy New Year to you all.